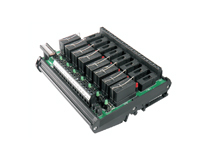 Trinity Touch offers a standard range of 1, 2, 4, 8 & 16 channel Electro mechanical relay modules. It included DC as well as AC coil relay cards available with options like fuse and indicators. Relay module with ultra slim relay have been introduced to compact the size of module. Customized modules are also provided as per customer’s requirements. Trinity Touch offers a standard range of 1, 2, 4, 8 & 16 channel Solid State relay modules. It included DC output type as well as AC output type relay cards available with options like fuse and indicators. Relay module with ultra slim ssr relay have been introduced to compact the size of module. Customized modules are also provided as per customer’s requirements. Our Passive module range consists of modules with flat ribbon connector, D-sub male & D-sub female connector, ELCO connector and RJ45 connector and many more. Customized modules are also provided as per customer’s requirements. A Utility module is used as a junction box for panel lighting and fan load in control panels. It has on board 5 A utility socket with switch, which can be used for tapping 230 VAC by simply plugging any 5 A Power Plug. By default some points are for 230V AC and others are for 110V AC but with the help of external wire jumpers, complete module can be used at single potential. A CNC module having 24 inputs and 16 outputs. Serve the purpose of one passive module (for CNC inputs) and one 16 channel relay module (for CNC outputs) on single module. Module with 16 interposing relays. FRC 50 connector is provided on input side of the CNC module for the termination of CNC inputs and outputs. A Diode O-Ring Module used when two SMPS are connected in parallel (Redundancy). 10A Module is used to connect two power supplies of 5A each. Increase overall system efficiency. Improve system reliability. Simple and inexpensive to implement. A Power distribution modules are used for distributing power to multiple field devices. installation time is significantly reduced because we have eliminated the need for external bridges or daisy chain wiring. simple and inexpensive to implement.